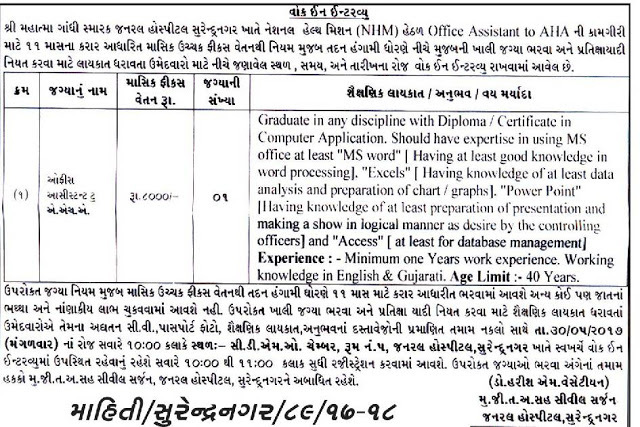 Qualification : Graduate in any discipline with Diploma / Certificate in Computer Application, Should have expertise in using MS Office at least “MS word” [Having at least good knowledge in word processing]. “Excels” [Having knowledge of at least data analysis and preparation of chart / graphs]. “Power Point” [Having knowledge of at least preparation of presentation and making a show in logical manner as desire by the controlling officer] and “Access” [at least for database management] Experience: Minimum one years work experience. Working knowledge in English & Gujarati. Date of Interview : 30-05-2017 at 10:00 a.m.